Nichole Elizabeth DeMeré is a B2B SaaS Consultant well known in the online marketing world. 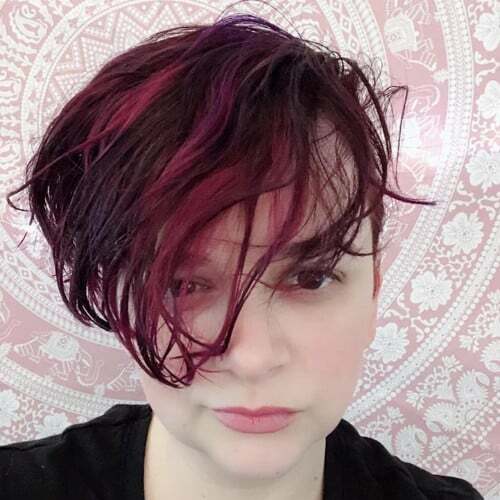 She also acts as a Moderator at Product Hunt & GrowthHackers.com, co-runs Customer Obsession Mastermind and is working on the SaaS Growth Playbook. Her roots in digital begin early. According to an interview with ThinkApps, she started doing SEO when she was 12, before she knew that there was such a thing as SEO. Around the same time, she learned about HTML, how to find source code, and started building her own websites. Since then, she has made a name for herself as an voice on customer centricity, cross-team alignment in growth, customer success, and more generally as an expert in all things SaaS and in community building. There’s a lot to learn from Nichole about marketing, and we cover a lot about influencer marketing, community building, content creation, and building quality relationships in this interview. Any content marketer, blogger, or marketer in general, will get something from this dialogue. You can find her on Twitter at @NikkiElizDemere or on her personal website here. What’s your process look like from ideation to article creation to distribution? Does your content creation process include content promotion planning, and if so, how? Usually I’m working with a B2B SaaS client (though I take on other clients) to create content for them, for their business. So the process begins by learning about the client’s business, and especially about their target client – what they want in life and work, what jobs they need to do, what’s preventing them from reaching their goals. It’s a very Customer Success-style approach, because I think the best content comes from knowing where the success gaps are between what your product does and your customer’s ultimate ideal outcome. Getting those pieces identified is where I spend most of my time. Then comes the easy part – brainstorming ideas that will help that audience get where they need to go. And, then the challenge becomes how to present this information in a fresh, honest, entertaining way that won’t get rejected by the business owners. Content promotion is just as important as content creation – but I think promotion works best when you’re tailoring what you promote to niche communities who will be genuinely interested in whatever topic the article is about. So I don’t blast articles out into the universe blindly. I post articles that are of interest and of value in communities where I’ve built a reputation for being helpful and creating value. So the readers are engaged, and are members of the target niche I’m trying to attract. How have you built up such an extensive influencer network? I’ve spent years contributing to communities, bringing value to them, and building genuine relationships within them – and I also manage and run them. I host monthly “virtual coffee” chats with friends I’ve made online in my fields, and with strangers who become friends, and we vent to each other and talk about life and work – just like friends do in-person. How do you maintain relationships and networks in the content space? Is it difficult to maintain as the size of the network increases? How do you overcome challenges of scale in maintaining your network? We consultants, content and copywriters are all online, most of us actively trying to help each other out. We’re in Facebook groups like The Copywriter Club. We’re in Slack channels. And on Twitter, of course! The way the relationships begin, for me anyway, is first through sincere admiration for the other person’s work. Following what they say, commenting on it, engaging in the conversation without seeking to ‘get’ anything. Then I might send a DM to talk more about something. And then if I see a way I can do that person a good turn, help them out in some way, I offer. Because that’s how you form real relationships. Friendships. When it’s not about what you want to get from someone else, but what you have to offer. As far as the challenges of scale… there are many. I’m barely (rarely?) able to answer all of my emails every day (I get hundreds, if not thousands per week, not counting newsletters), and my Twitter messages and Facebook messages and LinkedIn messages. I’m working with one of my writer friends, Shayla Price, to help with my LinkedIn and Twitter messages, just to help me sift through what is and isn’t a good fit for me. But email – that’s the tough one. Because building genuine relationships is so core to who I am online, I don’t want to hire a virtual assistant to help with it. What content creation or promotion processes do you automate? Conversely, which parts do you fundamentally believe cannot or should not be automated? I don’t automate content creation – but when I can, I’ll make the research part easier by reaching out to HARO respondents. There are lots of willing experts out there! As for content promotion, I’ll set up IFTTT with my favorite blogs to auto-post to my Twitter when new posts go live. And I do amplify content, but not through automation – I will write individual posts sharing the content with communities I’m part of that are likely to benefit from that content. That’s how I get higher engagement, more comments, and more conversations going around the content I post than I could if it were automated. How do you approach content promotion differently on different channels (e.g. SEO vs social)? On LinkedIn, it’s to network. On Product Hunt it’s to connect with other makers and with new product enthusiasts and help each other out. On Slack, it’s less formal, we’re on there to make our work days a little easier and connect with other far-flung colleagues. On Facebook, it depends on the group. Some social channels shouldn’t be places for content promotion because reading other people’s content isn’t why people are there. My litmus test is: Is this piece of content helpful, interesting to, and appreciated by this audience? If yes, I’ll post it. If not, I’ll post elsewhere. You have to talk where people want to hear what you have to say, not just shout at them because that’s where you happen to be. How are you able to consistently create content that stands out from the noise on the internet? How do you differentiate and get attention now that there is so much noise? I pay close attention to what I subscribe to – and what I unsubscribe from – and ask myself: Why? Why does this make my must-read list every week, and the other gets chucked into the Spam folder? What I’ve noticed is that the content I read is written with the value it can offer ME, the reader, in mind. Not what they can get from me, or get me to do, but what they can give me. That’s how I write my content. What value can I offer you, the reader? How can I teach you something and make it fun? The other differentiator I use is myself. Me. My opinions. My values. My stance on different issues. I think a lot of content creators want to try and please everyone, but that’s how you get banal, mediocre posts nobody reads. Figure out what’s important to you, what you believe in, what you love, and what you loathe, and let that be part of your voice. How do you think about quality vs. quantity in content creation? Is there a tradeoff? If so, how do you consistently put out great content at the pace that you do? I have a secret weapon: My editor. Having someone smart, talented, and knowledgeable, with – and this is important – the same values to bounce ideas off of, who can edit and help with revisions greatly increases the amount of high quality content I can create. What do you see as the biggest challenges and opportunities in content in the coming years? How do you plan on overcoming the challenging and taking advantage of the opportunities? 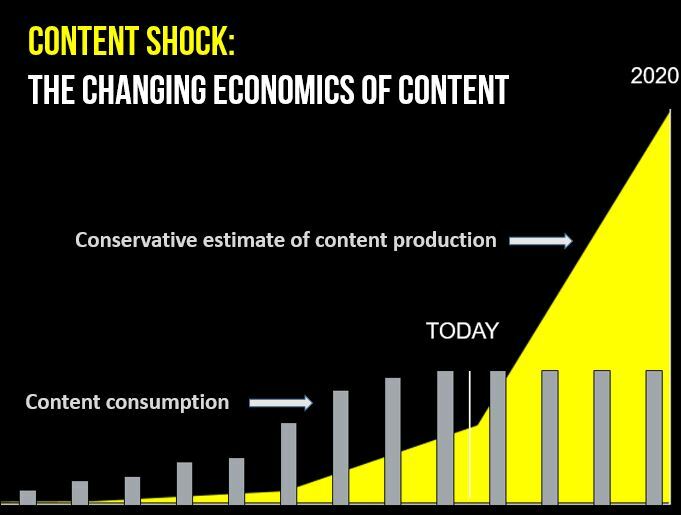 Content shock – the idea that as more and more content is created every day, but the number of readers remains finite – is going to be the biggest challenge. Right now, we’re at the point that any content that isn’t original, extremely helpful, and fun to read is getting lost in the sea of mediocrity. Soon, I don’t think even that will be enough. It’s going to take not just high quality, original content (that’ll give you parity), but also establishing your reputation as someone who delivers real value in a fun/interesting/innovative way, building your following, and doing your own PR and social media outreach. “The way the relationships begin, for me anyway, is first through sincere admiration for the other person’s work. Following what they say, commenting on it, engaging in the conversation without seeking to ‘get’ anything. Then I might send a DM to talk more about something. And then if I see a way I can do that person a good turn, help them out in some way, I offer. Everyone I’ve met who has a powerful network or is a super connector talks about relationships in a similar way. Basically, those who are tacticians and look at what they can get from the other person never end up building a network. It’s those who simply view relationships as the means to the end, not as a means to a transactional end (what’s in it for me?) that do the best. It’s so easy to see through the motives of someone who just wants to get something from you. That’s why it’s so refreshing when someone, such as Nichole, reaches out with genuine interest. In my opinion, that’s the key lever in relationship building. Also, you can tell what camp someone falls in by the language they use. Do they talk about needing to “network” with “influencers”? Or do they talk plainly about the interesting work that others are doing and how curious they are to learn more? Those in the former category, in my opinion, are only ever going to build a superficial network. As Nichole said, you need to ask yourself what users are there to do. When it comes to LinkedIn vs. Slack vs. email promotions, you can usually find some subtle but meaningful differences in how you need to operate to effectively promote on those channels. I see an article or question every day on “how to effectively market/promote on Reddit.” The answer, I always joke, is you don’t. Leave those poor cynics alone and let them enjoy the robust community they’ve built. Unless you’re a Redditor yourself, you’ll likely fail. Sure, there are hacky ways around it to get a quick hit of sweet Reddit traffic. But is it worth it? If you ask me, not usually. The point being: market intelligently. Don’t just go around spraying and praying everywhere. Hacker News won’t respond in the same way that Facebook will, nor should you expect them to. Here’s what it means: there’s more noise everyday, so it’s increasingly difficult to stand out. While this is true, there will still be ways in the future for outstanding, helpful, entertaining content to reach an audience. It may require more creativity or raising the quality bar even higher, but it will still be possible. In the long run, those who create remarkable content and answer reader/user problems very well tend to win, and they tend to win more often as the future progresses and algorithms on Google, Facebook, etc., get better at identifying content that gives a good user experience. In any case, the point on content shock is important, because it means you cannot and should not create a bunch of mediocre repackaged content. You’ve got to stand out in a meaningful way.